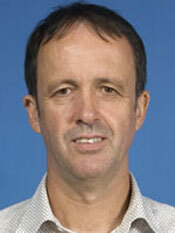 Michael Colin Lawrence was born on the 15th July 1955 in South Africa. He obtained his BSc in 1976 with distinction in all three major subjects (Mathematics, Physics and Applied Mathematics); his BSc (1st class Hons) in 1977 in the field of Theoretical Physics and his PhD in 1980, all from the University of Cape Town, South Africa. His PhD Thesis title was: ‘A semi-classical model of proton tunnelling in hydrogen-bonded compounds’. During his doctoral studies he developed skills in semi-classical modelling techniques and applied these to the phenomenon of proton tunnelling. They showed, for the first time, how tunnelling contributed to the infrared spectra of various systems. The research resulted in six publications during the period, which was considerable given the academic isolation of South Africa at the time. In 1981, he decided to make a change from the mathematical/physical sciences to the biological sciences and move into structural biology. He was accepted into the Laboratory of Molecular Biology (Cambridge, UK) as a postdoctoral Fellow from 1981 to 1982. There, working with Dr Phil Evans, he learnt the techniques of protein crystallography, crystallographic software development, and computer image processing as it relates to the high-resolution analysis of biological macromolecules by electron microscopy. Protein crystallography was then in its infancy and the determination of a single structure could typically take years post crystallisation compared to today where it can in some instances take only a few hours. While at Cambridge Mike determined and published the structure of the allosterically-inhibited form of the glycolytic enzyme phosphofructokinase. In this work he developed methodology which enabled them to elucidate from diffraction data the changes in tertiary and quartenary structure that accompanied the enzyme’s allosteric transition. In addition he worked with Dr Tony Crowther on the development of algorithms for image alignment in tomography based on fiducial markers; and on methods for determining the loss of thickness of sectioned material in electron microscopy as a consequence of radiation damage. Mike published this work in two papers and a single author book chapter. He then returned to South Africa to fulfil a contractual obligation of his postdoctoral funding. From 1983 to 1985, he was a Senior Medical Researcher at the Institute for Electron Microscopy, South African Medical Research Council, Tygerberg, South Africa and from 1985 to 1987 he was Director of the Electron Microscopy Unit at the University of Cape Town, South Africa. His responsibilities included managing a staff of five people and three electron microscopes and delivering electron microscopy services to researchers campus-wide. In addition, he conducted a small research project into the application of the maximum entropy technique to electron microscopy tomography. He joined the CSIRO Division of Protein Chemistry in 1988 as a Senior Research Scientist being progressively promoted through Principal Research Scientist, Senior Principal Research Scientist to Chief Research Scientist. From 1991 to 2000 he was seconded to the Biomolecular Research Institute (BRI), a joint venture between CSIRO and the Victorian Government’s Strategic Industrial Research Foundation. The BRI was located within the CSIRO laboratories at Parkville. With the closure of the BRI on 31 December 2000, he returned to CSIRO. His 19 years at CSIRO/BRI established his career and reputation in structural biology. During his final years at the Parkville laboratory, Mike was in charge of the X-ray crystallography group and oversaw the operation of the Bio21 Collaborative Crystallisation Centre, established at CSIRO, Parkville in 2006. He resigned from CSIRO in April 2007, following the closure of the insulin receptor research program at CSIRO Molecular & Health technologies, and its subsequent transfer to The Walter & Eliza Hall Institute of Medical Research (WEHI), Melbourne. Mike joined WEHI as a Research Fellow to continue the insulin receptor research there with Colin Ward, who also joined WEHI as a Part-Time Fellow in April 2007. Since 2004, Mike Lawrence has been an international Visiting Lecturer within the Carnegie Corporation-sponsored Structural Biology Master’s Degree Program at the University of Cape Town, South Africa. The aim of this program was to establish for the first time the discipline of structural biology within the South African research community. Mike Lawrence was recruited to the Division of Protein Chemistry to work with the Chief, Dr Bruce Fraser, on the structure of keratin. However, before Mike arrived in Melbourne Bruce Fraser retired in August 1987 unexpectedly. The retirement was prompted by the McKinsey-assisted restructuring of CSIRO. Before transferring to work with Peter Colman on crystallography of globular proteins Mike succeeded in publishing a new interpretation of the keratin fibre diffraction pattern [Lawrence MC, 1989, ‘Modelling the surface lattice of alpha-keratin filaments’, Int. J. Biol. Macromol., 11: 285-289]. His first crystallography project in Peter Colman’s group was the crystal structure of the seed storage protein phaseolin, a problem which had previously proved intractable. Mike undertook a comprehensive re-analysis of the data and a re-development of much of the software being employed in order to explore a wider range of approaches to the problem. In particular he re-developed non-crystallographic symmetry-averaging software and implemented this on the new Silicon Graphics computers which had just entered the market. His endeavours proved successful and the structure was finally determined to a resolution of 3.0 Å. This enzyme is of interest in the commercial production of N-acetylneuraminic acid. CSIRO wished to understand its structure and mechanism in order to engineer it to produce sialic acid derivatives with specific stereochemistry. Mike guided the PhD studies of Ms T Izard and Mr J Barbosa and they successfully determined the structure of the enzyme from two bacterial species. He worked together with Mr H Ooi, a PhD student in chemistry, to determine the structure of a number of enzyme-ligand complexes, showing for the first time how the Schiff base complex is formed. He also showed how the enzyme typifies a broader family of evolutionarily-related aldolases. Mike developed a metric Sc to quantify the geometric fit of two protein surfaces [Lawrence MC, Colman PM, 1993, ‘Shape complementarity at protein/protein interfaces’, J. Mol. Biol., 234: 946-950]. This measure has since proved enormously successful (paper cited in excess of 410 times) and has been used to assist understanding of the interaction between the T-cell receptor and the MHC/antigen complex [Garcia et al., 1998, Science, 279: 1166-1172] and in understanding the intimate packing within amyloid fibres [Nelson et al., 2005, Nature, 435: 773-778]. This work was undertaken as a collaboration with Professor James Paton, then at the Women’s and Children’s Hospital, Adelaide, South Australia. Professor Paton provided the protein and Mike together with his research technician Ms Pat Pilling, undertook crystallisation and structure determination. The structure proved to be the first representative of a novel class of ABC receptors and was the first protein from S. pneumoniae to have its crystal structure determined. This work was done ahead of competitors in the USA working on a related protein from Y. pestis. This work was part of a collaboration with Biota Holdings (Ltd). Mike Lawrence worked on this project together with Dr Lin Chen, an in-house postdoctoral fellow who grew the crystals. Mike was responsible for all of the protein crystallography. The crystallography proved to be particularly difficult, in that the crystals were difficult to cryo-protect, very radiation sensitive, capable of growing in two closely-related forms and anisotropic in their diffraction. In addition, significant parts of the molecule were disordered. Solution of the structure involved extensive room temperature synchrotron data collection, as well as complex phase extension by non-crystallographic symmetry averaging. In addition, he developed ways of generating xenon derivatives of these crystals, the first time that this approach was used in Australia. Biota Holdings were interested in using the structure as a model of the human respiratory syncytial virus fusion protein and two models of RSV-F have since been developed based on the CSIRO NDV-F protein structure. The paper describing the structure was Chen et al., 2001, Structure, 9: 255-266. Mike determined this structure together with a PhD student Ms Natalie Borg, whose doctoral work he was co-supervising. This structure provided insight into the likely mechanism by which the neuraminidase active site of the molecule can be switched to have a (non-catalytic) haemagglutinating activity, namely via a rotameric rearrangement of a catalytic tyrosine residue. The structure was the first to be determined for this enzyme from a human pathogen [Lawrence et al., 2004, J. Mol. Biol., 335: 1343-1357]. This work was undertaken in collaboration with Dr Robin Hill at CSIRO Molecular Science in Sydney. The ecdysone receptor is a nuclear hormone receptor and is of particular commercial interest as an insecticide target. They were interested in understanding the way in which this receptor varies across insect taxonomic orders as certain insecticides targeting this receptor show distinct specificities with respect to such taxonomic order. They were able to determine the structure of the receptor from an hemipteran source and to compare it with that from a lepidopteran source to reveal for the first time the likely source of the marked decrease in binding ability of the bisacylhydrazine compounds for the hemipteran receptor compared to that for the lepidopteran receptor [Carmichael et al., 2005, J. Biol Chem., 280: 22258-22269]. As a result, they were able to establish a patent position in this area ahead of international competitors who were backed by Bayer CropScience and a world-leading nuclear receptor structural biologist. In a collaboration between Colin Ward’s group at CSIRO and Professor Andreas PlÃ¼ckthun’s group in Zurich, Mike solved the 3D structure of a designed ankyrin repeat protein targeted towards the epidermal growth factor receptor family member HER2 [Zahnd et al., 2007, J. Mol. Biol., 369: 1015-1028]. The structure explained the unusually high affinity of this particular protein for its target. use of microbeam technology at synchrotrons (ESRF, SLS) to explore very small crystals. Whilst a number of other leading groups worldwide have endeavoured to determine this structure, the success of the CSIRO group was due to their ability to: produce high-quality protein in large quantities; consider a broad repertoire of insulin receptor constructs and early adoption of robotic crystallisation technology. This work was published in Nature in 2006 [McKern et al., 2006, Nature, 443: 218-221] and discussed in a number of subsequent reviews. Lawrence MC, 2010, Personal communication.